Did you think that the haunted woods meant that there were ghosts hiding out among the trees? As you can see by the Haunted Tree Stump, that certainly is not the case, as the haunted woods are actual trees that happen to be haunted and possessed! This impressive and ghoulish looking tree stump is the just the type of tree that one would expect to find growing in a haunted woods. It features a dark brown coloration with realistic looking bark, while its gnarled and twisted roots act as a base that holds the tree stump up. Its mouth is oddly reminiscent of a jack-o-lanterns, featuring a jagged, curving smile that is filled with sharp, carved teeth. 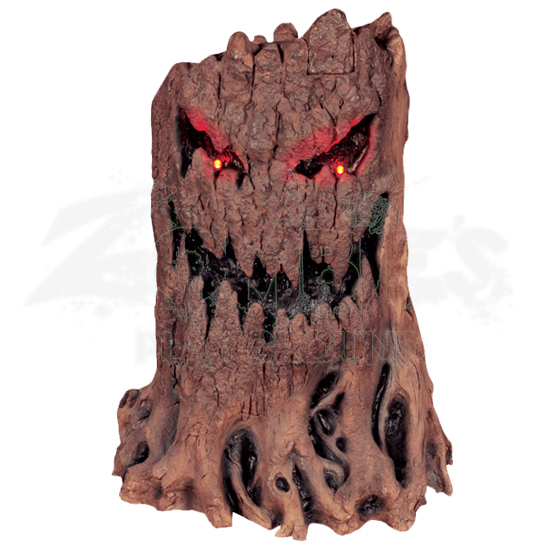 Splits in the bark act as the tree stumps eyes, which feature glowing pint-points of red light, which gives the tree a rather creepy and sinister look. When activated, the trees eyes glow brightly, and it makes spooky sounds. This tree is made from quality fiberglass and is a great indoor and outdoor decoration. It measures approximately 30 inches tall and is battery operated, requiring 3 AA batteries to function (which are not included). 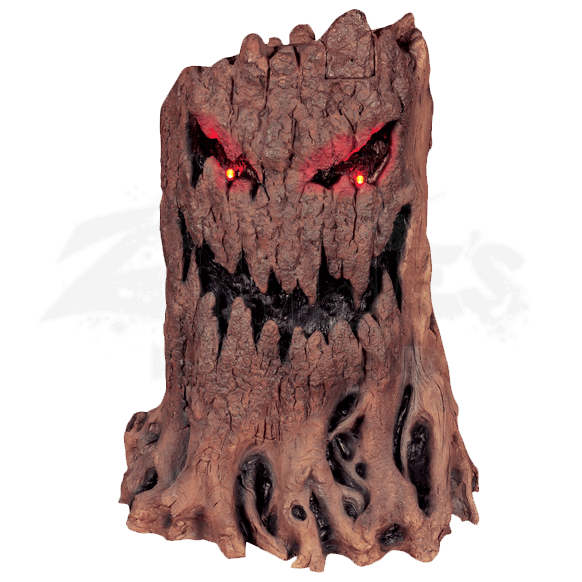 Plant this Haunted Tree Stump in your yard and watch as its striking appearance causes others to stop and consider its appearance, even as its eyes glow and it makes sinister sounds.